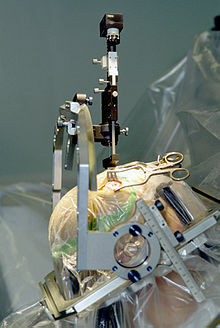 Insertion of an electrode during neurosurgery for Parkinson's disease. Neurosurgery is the surgical specialty that focuses on diseases and injuries involving the brain, spinal cord and peripheral nervous system. This page was last changed on 5 November 2014, at 17:24.